Hosting dinner parties can be a lot more fun if you have unique napkins and placemats to show off! 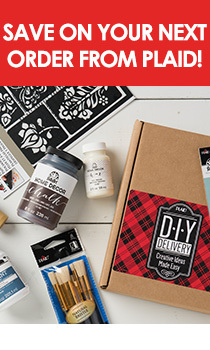 For this how to you’ll need: Stencil1 Damask Nature stencil set, West Elm Center Stripe Woven Placemat Set, West Elm napkin FolkArt multipurpose paint, and stencil brushes. Step 1: Decide what colors you want to stencil with. Chose a color based on the palette of the placemat and napkin you are stenciling. You may decide to choose a color that will pop against the napkin or one that is more subtle. We chose an earthy brown called burnt umber to compliment the blue stripe on our placemat. Step 2: Place the stencil on the placemat so that it is centered. When stenciling on cloth, it is helpful to spray the back of the stencil with a low-tack spray adhesive. This will prevent the stencil from moving while you are painting. Step 3: Pour some paint on a plate and dab your stencil brush in it slightly. Brush excess paint off on cardboard or toilet paper. Stenciling is a dry brush technique, this means using very little paint. You can apply several layers of paint to make the color more saturated. Step 4: Begin stenciling the placemat using and up-and-down or circular motion. Step 5: Lift the stencil carefully and allow the paint to dry to touch. Step 6: Now that your placemats are ready, it’s time to make matching napkins! We placed the stencil so that the sparrow is at the bottom of the blue stripe, slightly overlapping into the white area. Step 7: Follow steps 3 through 5 to stencil the sparrow on the napkin. Do this for all four napkins. Step 8: Use an iron to heat seal the paint. Enjoy dinner with a nice glass of wine and snap a photo of your placemats and napkins to share with us @Stencil1.